London Welcomes A Perfect Oklahoma! Snapshots of London, Summer 1998: Tourists flock to Buckingham Palace and Harrod's, the Millennial Dome begins to rise in nearby Greenwich, and at the austere Royal National Theatre on the South Bank, the corn is as high as a elephant's eye. A new production of OKLAHOMA!, directed by Trevor Nunn and choreographed by Susan Stroman, opened at the National's Olivier Theatre on July 15. And on July 16? ""The Royal National Theatre awoke to a beautiful mornin',"" wrote Matt Wolf in Variety, ""as the raves poured in."" Robert Gore-Langton in The Express pledged, ""If this doesn't give the National a blazing hit, I'll hang up my spurs."" From Charles Spencer in the Daily Telegraph: ""It is a real pleasure to report that the National has a huge hit on its hands."" And from Susannah Clapp in The Observer: ""Vocally soaring, visually glowing, it is the most sure-fire musical success since CHICAGO."" 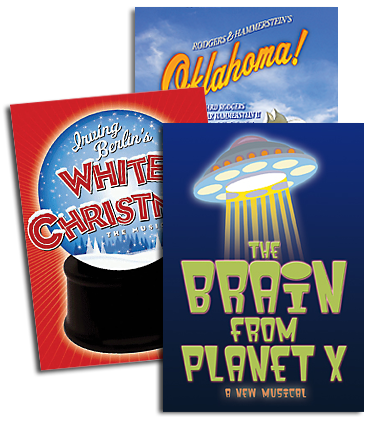 Scheduled for a straight run through October 3, OKLAHOMA! took in over 60,000 the day after it opened topping a Royal National Theatre record set by CAROUSEL five years earlier. Breaking its own record repeatedly over the next 3 days, OKLAHOMA! then surpassed even the most optimistic expectations: At stake was the National's best-day record of 91,000 for ticket sales from all three of its theatres combined; on the Monday following its opening, OKLAHOMA! generated 104,000 in ticket sales by itself. By early August, less than a month into the three-month run, the National announced that all remaining performances were sold out. ""This perfect OKLAHOMA!,"" reported the Wall Street Journal, ""follows the precedents of the company's CAROUSEL and GUYS AND DOLLS in both artistic quality and in playing to guaranteed full houses that will contribute to balancing the National's budget."" For Trevor Nunn not only this show's director but also the National's newly appointed Artistic Director the sound of cheering critics combined with a booming box office could not have been sweeter. Though Nunn was head of Britain's renowned Royal Shakespeare Company for 18 years, and is equally at home in opera and film, he has made his mark globally as the director of such mega-musicals as CATS, STARLIGHT EXPRESS and LES MISRABLES. Meanwhile, during the tenure of his predecessor, Richard Eyre, the National had become, to quote the Daily Telegraph, ""as noted for Oscar Hammerstein II as for David Hare,"" with landmark revivals of CAROUSEL, GUYS AND DOLLS, LADY IN THE DARK and SWEENEY TODD to its credit. As new head of the National, beginning in October of 1997, Nunn was determined to continue this policy. In December of 1996, as he prepared for his inaugural season, Nunn visited the R&H office in New York. ""It was a bit of a surprise when Trevor came to see me,"" R&H President Ted Chapin recalls, ""because, frankly, I hadn't thought OKLAHOMA! was a show that would interest him much. But a few weeks later at lunch with Mary [Rodgers] and Jamie [Hammerstein], Trevor was extraordinary. He told us his key into OKLAHOMA! was Aunt Eller's line in The Farmer and the Cowman': I don't say I'm no better than anybody else/But I'll be damned if I ain't just as good.' Trevor spoke the line with great weight and said, Revolutions have been launched over statements like that.' Clearly, we would be seeing an interesting production."" One factor that would make his production interesting: Nunn's desire to replace the Agnes de Mille choreography so intrinsic to this musical with the work of a contemporary choreographer. R&H consented, and wholeheartedly approved his choice: two-time Tony winner Susan Stroman, subsequently dubbed ""the de Mille of the Nineties"" by Observer dance critic Jann Parry. When Nunn offered her oklahoma!, Stroman recalled to the Daily Telegraph, she ""nearly stopped breathing. In the States it is revered, sacred ground...[But] we have approached it as if it were a new work."" In the spirit of ""a new work,"" Nunn and Stroman looked for fresh faces to bring their OKLAHOMA! to life. Heading the cast of mostly newcomers were Hugh Jackman as Curly and Josefina Gabrielle as Laurey (Gabrielle had danced the role of Dream Laurey in a 94 U.K. tour, though this time a Stroman innovation had the principals dance their own ballet roles). They were joined by Shuler Hensley as Jud, Vicki Simon as Ado Annie, Peter Polycarpou as Ali Hakim, Jimmy Johnston as Will Parker and the indefatigable Maureen Lipman as Aunt Eller. The company of 34, wrote Mark Shenton for InTheatre, is ""one of the most formidably talented casts currently to be found in London."" Critics praised not only the cast, but the entire production. This oklahoma!, pronounced the International Herald Tribune's Sheridan Morley, ""is the best we are ever likely to see in the rest of all our lifetimes."" David Benedict in The Independent called it ""not so much a re-creation as a full-blown rediscovery."" Georgina Brown in the Mail On Sunday called it ""a revelation,"" and Robert Gore-Langton in the Express said, ""In Trevor Nunn's production, OKLAHOMA! looks newly-minted...It's brimming with unexpected joys and exquisite craftsmanship, a fine production that simultaneously celebrates and reinvents the musical's own heritage."" And from the side of the pond where Oklahoma! was born, a few critics who crossed over to London had this to say: ""Leave it to the British,"" wrote USA Today's David Patrick Stearns, ""to rediscover what made the show work originally and then move it forward to speak more directly to our times."" Laurie Winer in the Los Angeles Times said: ""Once again, the National has approached Rodgers and Hammerstein with the same care and intellectual respect it would show to Ibsen. And once again, Rodgers and Hammerstein prove worthy."" Benedict Nightingale of the New York Times observed: ""In Mr. Nunn's superlative production, you feel much the same sense of peace and truthfulness that refreshed the Broadway crowd in the war-riven world of 1943,"" and Clive Barnes in the New York Post, who recalled seeing the original 1947 London stage production as an R.A.F. veteran, ""fell madly in love with it all over again."" So did the rights holders. Mary Rodgers told the Evening Standard that this version was ""better than the original."" She continued: ""There is such truth in this production that I don't want to see another,"" and in Variety she said simply, ""Trevor's a bloody genius."" Jamie Hammerstein told the Mail on Sunday why he was leaving London before the opening: ""I'm so confident in the show that I don't need to stay any longer. It's a terrific, historic production, with a passion I have never witnessed before."" To the Daily Mail he said, ""I'm full of admiration for Trevor and for my father."" ""When director Nicholas Hytner picked up the Olivier Award for Rodgers & Hammerstein's CAROUSEL [also at the National],"" David Benedict observed, ""he remarked that all he had done was direct the subtext, and Nunn does the same."" Asked by the Daily Telegraph to explain what drew him to OKLAHOMA!, Nunn said, ""It's pure and simple and folk,' but very profound. These people find themselves settling in God's acre, in a kind of paradise. They must decide who is going to live there and on what terms. It's a kind of turbulent question. There's a war going on, a war about fences between the cowmen and the farmers. It's a nervy time."" As he concluded the interview, Trevor Nunn director of Shakespeare, Chekhov, Hugo, Stoppard and Mozart tapped a script of OKLAHOMA! lying on his desk and said, ""It's all there."" OKLAHOMA! has concluded its sold-out engagement at the Royal National Theatre's Olivier Auditorium, though at this writing discussions are underway to transfer it to London's West End early next year... ""Somewhere, somehow, get this production to New York!,"" wrote Clive Barnes in the New York Post; plans to do just that are also currently under discussion. Look for further details in our next issue.